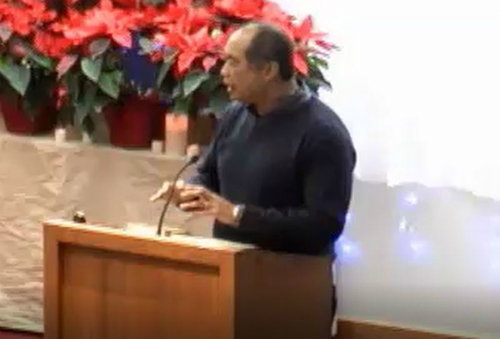 In Matthew 25, Jesus gives us three famous parables about what the end of time is going to be like—The Ten Virgins, The Talents, The Sheep and Goats—and I was asked to preach on the third of these on December 31st, the last Sunday of 2017, under the title “Sacred Doing.” Our church often wants me to speak on topics having to do with social change and social action—partly, I suppose, because of me teaching social change and my ties to Emmanuel House—but here I took an approach different from the change-the-world message that’s usually associated with social action. Christians often make a point of saying that what they do, they do “in God’s name,” “in Jesus’ name,” but what struck me most about the exchange above is that “the righteous” had no idea they were doing what they did in anybody’s name, least of all—it seems—that they were doing this to God or for God. 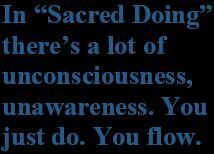 Thus, my main point: In “sacred doing” there’s a lot of unconsciousness, a lot of unawareness of what you’re doing. You just do. You flow. But there’s an even deeper reason to relax and just flow, and I approached this through the concept of detaching from time. We’re creatures of time. Things happen to us in time. But the very notion of God suggests there’s also a realm out of time, an eternal realm where there isn’t any time. If we’ve ever been so absorbed in something that time seems to stand still, or we’ve simply lost track of time altogether, then we’ve touched timelessness in very real ways. From the point of view of time, we’re weak, struggling, imperfect creatures—sinful, if you will—but if we accept God, then from the point of view of eternity we’re already perfect, we’ve already arrived. That’s why, ultimately, you can detach from winning: you’ve already won. And, ultimately, you didn’t have do anything to win. God did this for you. In a very real sense, “sacred doing” means realizing that something outside us is doing for us. The sermon fleshes all this out. I hope you enjoy it. 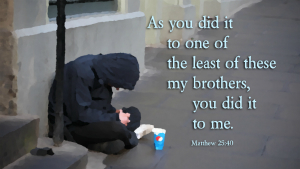 This entry was posted in Faith, Music & Media Podcasts and tagged Chuang Tzu, Matthew 25: 31-46, Sacred Doing. Bookmark the permalink.